We had a meeting with our accountant today, so I decided it was imperative to reward ourselves with a nice meal. Black Sheep Bistro has been on my list for several months now. Since we were in the area, it made for a perfect lunch stop. I had heard nothing but good things about this little cafe located in Old Town Spring on Main Street, so I had high expectations which can always be a little dangerous. The menu was relatively limited, but I don't consider this a detractor at all. All to often restaurants with extensive menus (BJ's, Olive Garden, etc.) turn out a mediocre product. Since the menu was limited, it didn't take long for us to decide on the crawfish mac and cheese as an appetizer. The waiter delivered some bread to our table while we waited on our app. The butter for the bread was tasty, but a little heavy on the garlic. However, it didn't stop me from eating it on a slice of the warm bread. Due to a slight hiccup in the kitchen, our mac and cheese ended up arriving at the same time as our food. This dish was delectable, and I didn't want to share it. It was very creamy because of the marscapone cheese but also had a little spicy heat. It was extremely rich, so I am indeed glad we all split it considering the richness of my entree and dessert. For my main entree, I chose the lobster roll which had sriracha mayo, avocado, and of course, lobster. It was served with greens tossed in a light vinaigrette. I enjoyed the spiciness of the sriracha, but it did not overpower the sweetness of the lobster. With the cubed avocado, the texture was a bit creamy, but the flavor was very good. My dining companions ordered the beef short rib sandwich and the Black Sheep burger. No matter how hard I try, I unfortunately don't like lamb. However, I decided to risk my taste buds and had a bite of the Black Sheep Burger. I'm glad I took the risk. 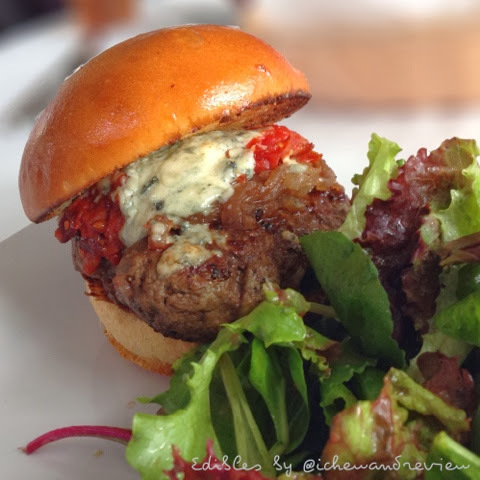 The tomato bacon jam and the blue cheese dominated the burger, so it helped hide the aftertaste of the lamb. Overall, it was very good as well. For dessert, we ordered coffee and creme brulee. It took a long time to receive our coffee, and it was extremely disappointing. I'm unsure of their brewing method, but it tasted like hot cardboard. At a place this nice, I was expecting something better than restaurant grade coffee and only refined sugar and Sweet and Low as sweetener choices. It's possible they may have other options that you have to ask for, but by that time, our waiter was so busy, it was not realistic to ask. Just skip the coffee when you're there. The creme brulee, on the other hand, should not be skipped. It was some of the best I've had. It was lighter than some creme brulees I've had in the past and it was not overly sweet. I could also taste the fresh vanilla in the custard. A winner. Overall, Black Sheep Bistro is a place you should visit if you are in the Old Town Spring area. The food they produce out of a fairly conventional looking kitchen is astounding. Aside from the service decline at the end of our meal, we all really enjoyed ourselves. And it wasn't as if the service were bad, but if I'm going to spend over $100 for lunch for 4 people which consisted of one appetizer, four sandwiches, one dessert and drinks, I expect a higher level of service than what we received in the second half of our visit. For the most part, Black Sheep met and possibly exceeded my expectations for quality of food. I look forward to going back for dinner very soon. For hours and updated menu, visit theblacksheepbistro.com. Reservations can be made through Open Table or calling the restaurant directly (832-616-3035). "Black Sheep gets a black eye"? You think service was bad enough just to maintain its "Black sheep" reputation? Food looks great, but service is to me the other 40% of the experience, I hope they pay attention to that, regardless I would definitely try the place. Great review Kim I'm a fan! The food was so good, and the service was adequate for the first half of the meal. It just went downhill when the lone server became bogged down with 5+ tables. I think his experience was limited as well.